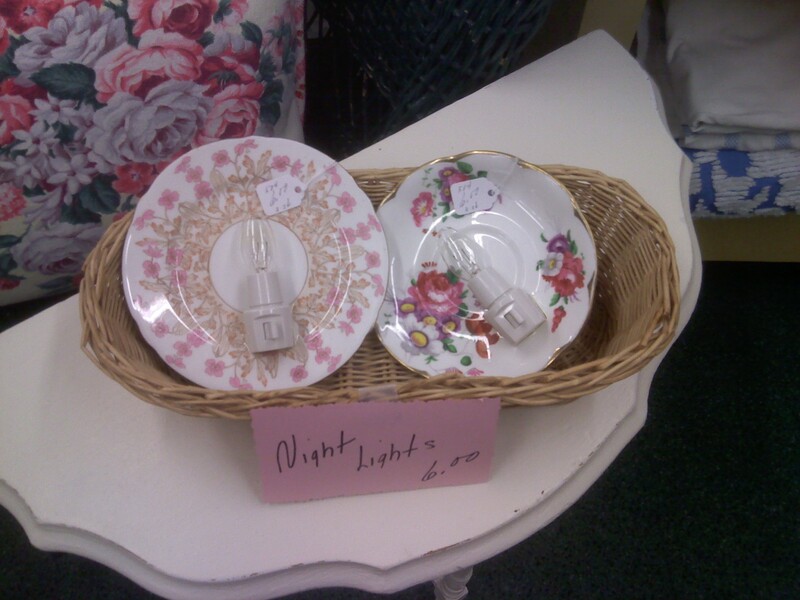 At a local antique mall, the Moorhead Antique Mall, I spotted another idea for salvaging vintage china pieces: turning tea cup saucers into nightlights. Also, your local hardware store may offer cutting services for a fee. Pick-Let’s talk some more about the antique recycling in our home. Grin-Does that mean you are finally going to clean out your clothes closet? P-No, silly. I mean our “decorating recycling”, things we have saved from a dumpster or land fill by fixing it up and putting it to a good use. How about discussing our latest find-our Big Screen TV? G-Well, that was your idea and it’s no wonder you want to tell everyone about it. P-Well, as far as that goes, you have some bragging rights too. You negotiated the price and got us a super-deal. And you made the improvements! It sure is fun to tell our friends and family about our new TV set. They know we’ve just recently replaced our black and white set with a color TV. So, they are astounded when we make the announcement. Remember when our son-in-law asked if it was a “flat screen” and we responded with “it’s actually convex.” The look on his face. G-So why don’t we tell the readers the whole story. 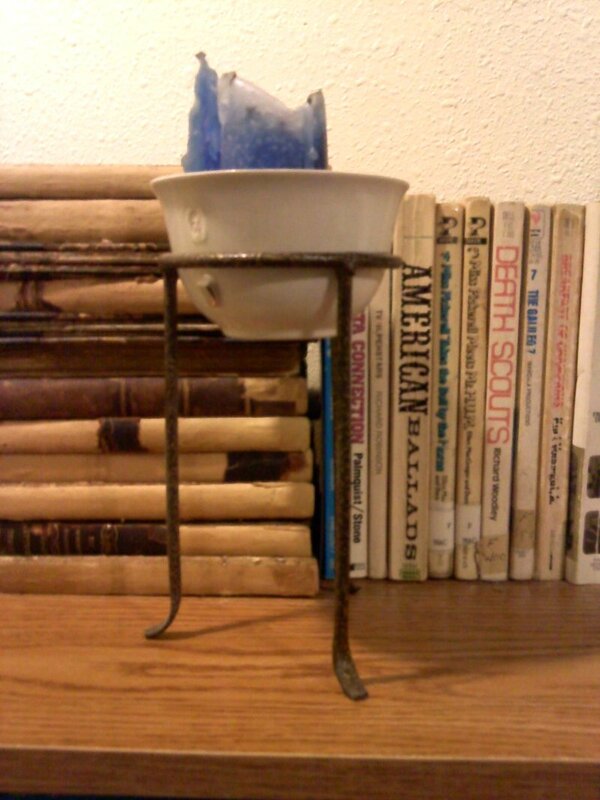 It was your off-the-cuff comment while exploring an antique mall that prompted our purchase. P-Oh, I remember walking into the booth and seeing the old Crosley cabinet – it was in great shape except no knobs or “guts” and I said you know what would look great in that 10” opening, a digital picture frame. You just left and went to the counter to have them contact the dealer, hopefully for a better price. I was not even aware that you were doing that, thinking you were not too thrilled with the concept. G-The dealer accepted the offer and when we got it home, the work began. P-Getting the right digital frame was the easy part, but I was a bit concerned about the hardware, especially the little light I recalled from TV’s of my youth. G-I knew I had knobs for a TV or radio cabinet downstairs. I do keep all of that stuff. P-And you think I never throw anything out, right! G-Even with all the junk I have, I could not locate a rotary on/off switch with a long enough neck to fit through the wood of this cabinet. G-Very funny, that box was empty. Finally, at the third store I found a switch. It was the type of store that has even more useless things than I have. I also found a lens that fit into the hole for the indicator light. You should remember that it took such a long time for the tubes to warm up and the indicator light let you know it was turned on. P-That’s WAAAAY before my time, but I do know that you have a built-in indicator that tells me when you are warmed up. I do remember mom sending me in to start it up before the Friday Night Fights came on. G-Was that any time when your rowdy family got together? P-You are such a hoot! G-Our last step was downloading pictures of family and friends and then we were set to turn it on. P-It worked great but something was missing. To make it look authentic, we needed a 1950s TV lamp. G-And no TV from that time frame would work without an antenna. We city dwellers would use rabbit ears that could be adjusted to pick up BOTH TV stations. G-What war was that, One or Two? Back to our project. We easily found several TV lamps from that time period and the antenna was spotted at an estate sale. P-It’s now complete, even have a doily that your mom made to finish it off. And when our son-in-law, the one with the mega-screen saw it, he laughed out loud, but I think I saw a bit of “screen-is-envy” there. G-You have always been so classy. You are a work in progress too, but good fun. It’s always great to work on projects with you. Tip for IV’s Collectors: Unlike regular retail establishments, most antique stores and malls have a level for discounting the price. Be sure to ask at the counter when shopping what is the stores discount policy. If an item is very expensive, you just might be able to negotiate by asking the mall personnel to contact the dealer. They often comply if you have an offer you’re willing to pay. Pick: This is going to be our first article for Inherited Values so let’s show off some of our unusual collectibles. Grin: How about your hand mirrors? You are always bragging to anyone that will listen, just how great you think they are and how well you display them. Pick: Oh, I’d like to but I’d have to polish them all before we let a whole group of people in to see the collection. Grin: Well, what’s your idea then? Or are you just Picking on me because it was my idea? Pick: Why don’t we start with the smallest room in the house and show readers what can be packed into a tiny area with a little imagination. Grin: Are you referring to your jewelry box? You sure know how to pack that thing full. Pick: Boy we’re real smart today. No I’m talking about the powder room at the back entrance, the one that started out with a bare bulb hanging from the ceiling with a pull chain for decoration. Let’s show off our antique finds in that room first. 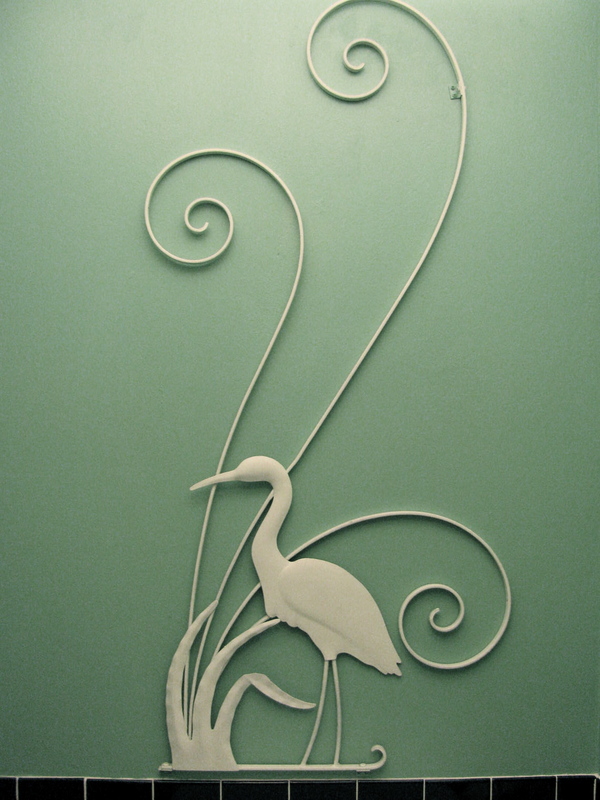 I think we managed to accent the room nicely with some unusual pieces in a space of seven foot by four feet. Plus we did our “green piece” by recycling some items. Grin: Five feet, it’s no longer than five feet. 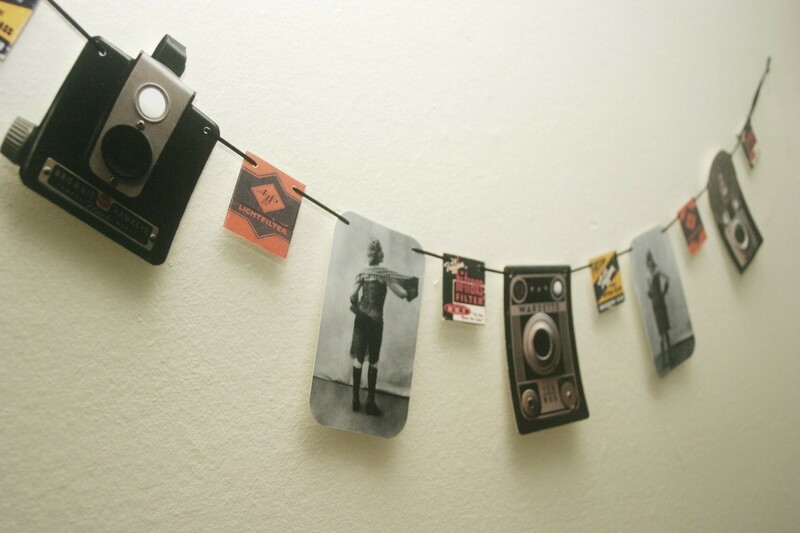 Pick: Well, whatever, the important thing is we get to display the oddities within. But just to keep my reputation intact, how about a quick measure to see who is right. I say it’s about seven feet by 3-1/2” feet. What is your best guess? Grin: I think five feet, maybe by 4-1/2 feet. Grin: In this instance, you were right. It fits in flush, right over the toilet, a pun intended! Pick: Well, if you’re giving me credit, I must say, your cold air return register was a perfect fit. 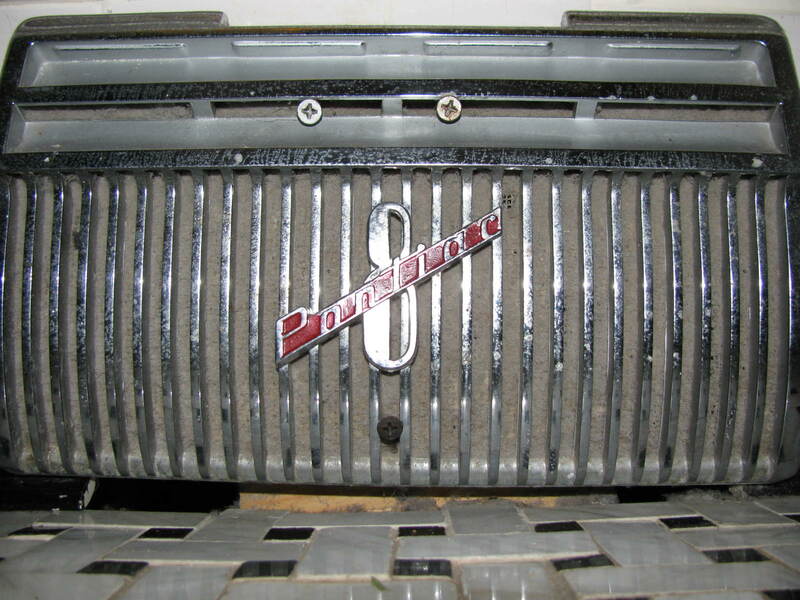 It’s a radio speaker grill from a Pontiac Straight 8, probably from the early 1950s. And it squeezed right into the space. Grin: I also recall where we got the old tin sheets that we needed when I dropped the ceiling to update the electricity to enable a wall switch. We had to purchase the full lot of sheets, but only needed a few and sold off the rest at a flea market. 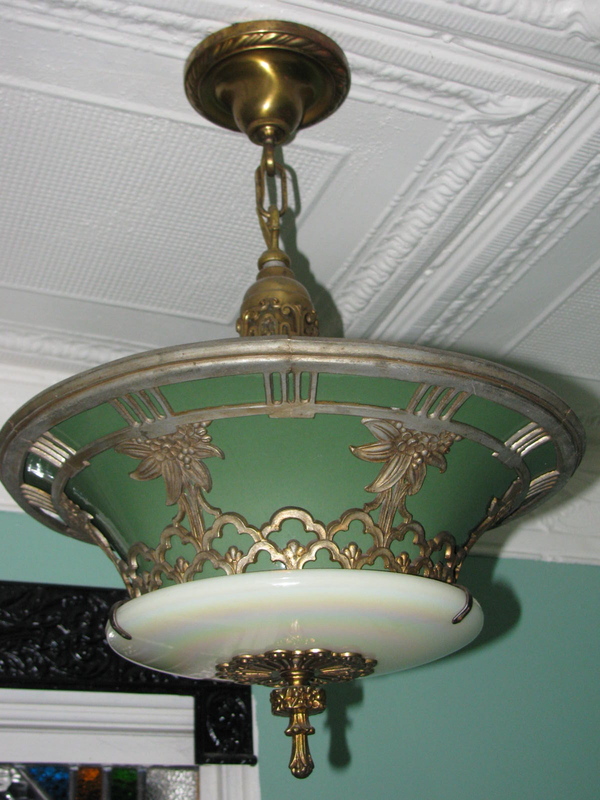 Then you found that marvelous iridescent chandelier at a local antique store. You discovered it just in time, too, because we had not decided on the color to paint the room and the green shade enlightened us. 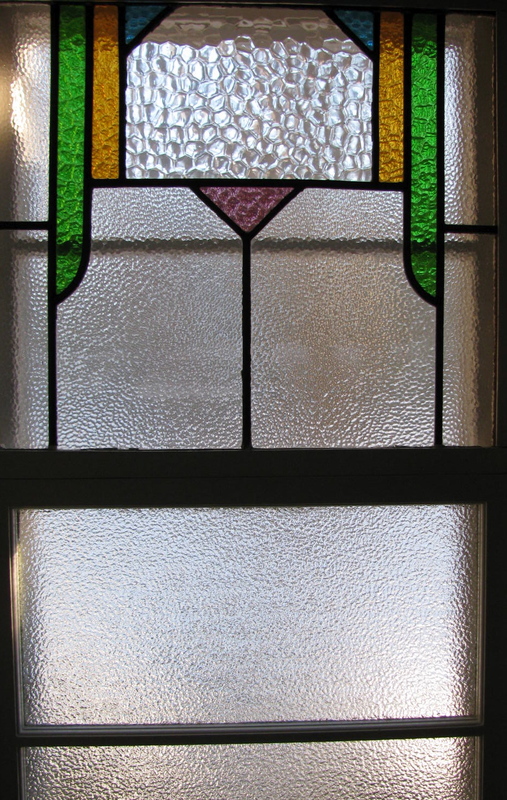 Pick: Dear, you are funny today – you should be “pun-ished.” And you kept your promise to let me have some stained glasswindows in the house. That was something you committed to when we left our other house that had so many! And you did a super job finding the black and white tiles that are so “1930s”, it really completed the look we wanted. Grin: Well, let’s continue in another area in our next blog. There’s hardly room for two of us in this room! 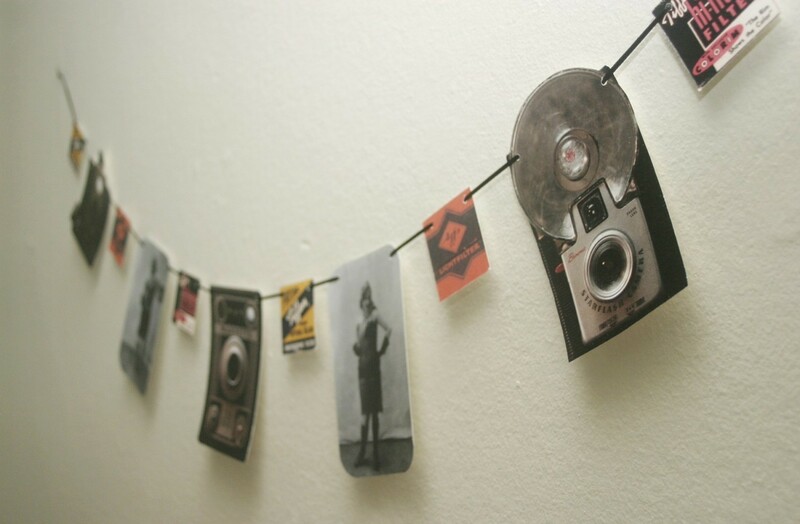 I like to use my vintage things, where appropriate (and sometimes I make up uses for things). I feel it really continues the life of old things. I also don’t like to let anything go to waste, even if it’s broken or damaged; but I’m especially reluctant if it was a part of my collection. Broken china, for example, can break your heart; but sometimes you can salvage or recycle it. Even if you can’t make jewelry from it. I suppose most people have discovered that the odd, mismatched china saucers, custard cups, and whatever all those little shallow bowls are, can readily be put back into use at the table simply by placing candles in them — or by setting candles in clear glass and/or candles in clear tea lights upon the old china pieces. It’s an especially lovely way to have them still sit at the table, lighting the more perfect pieces while you dine. But what about those antique china cups with the handles broken off? Usually they have glass candle holders in them. Well, when my glass candle dish broke, I realized I could set one of my (many) handless china cups in them. 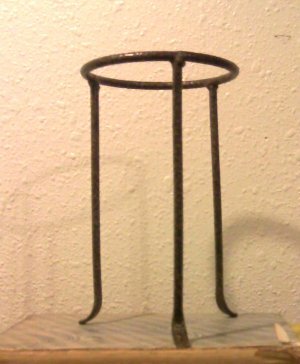 This works with most of these candle stands; even if they vary somewhat in diameter, you’ll find that the sloping sides of china cups eventually meet a secure resting place. 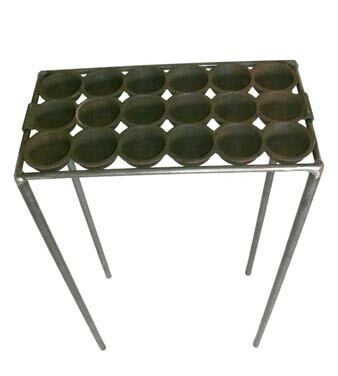 You can also stagger the candle heights by surrounding the cups recycled into metal candle stands with cups without stands, small dishes with candles, and plates with tea lights. 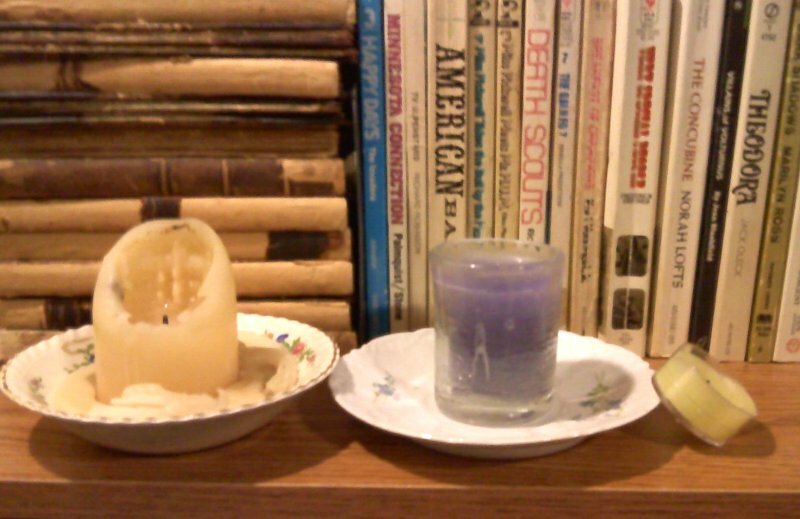 If you don’t have a cabinet full of candles — or you don’t have any that are just the right size, Katy Teson aka “Pie Bird — Who Vents While Cooking” (Isn’t that a hoot of name?!) shows you how to make tea cup candles! 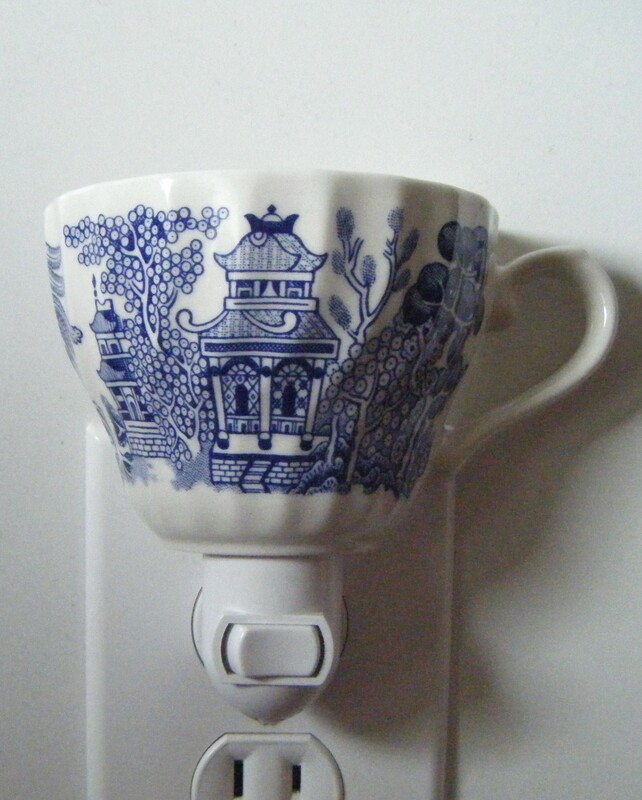 So go ahead, recycle those old mismatched china pieces and damaged china cups. 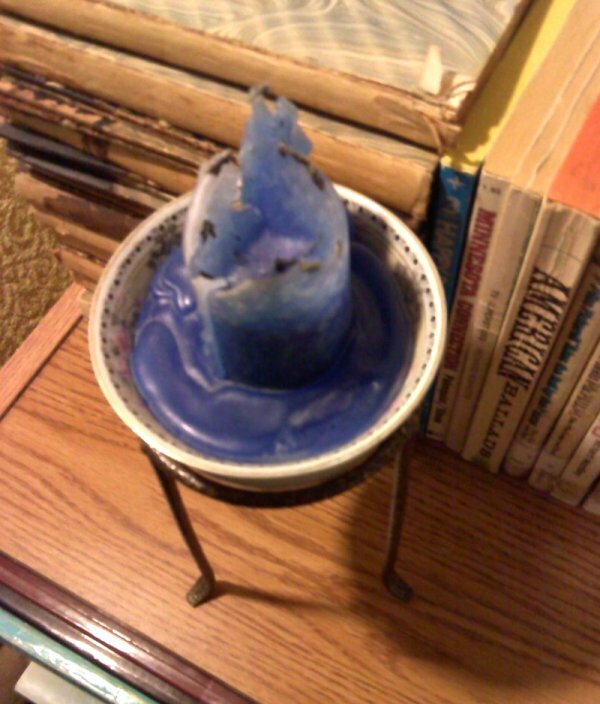 Disclaimers: I’ve never had any problems, but I will caution you that some candles may burn too hot to hold candles safely, meaning the china may crack. (And china that is already cracked probably won’t contain melted wax — though you can put a saucer beneath it all too). If you’re concerned at all, you can set clear glass votive holders inside the cups to hold the actual candles. Or you can, as many candle owners do, simply place the candles in or on the vintage china pieces just for show. 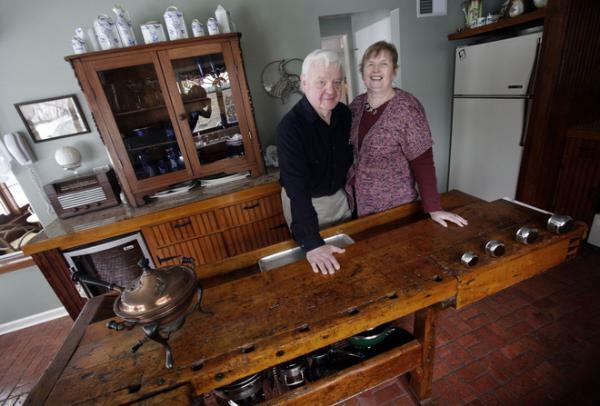 My parents (of No Egrets Antiques — also found at both iCollect247 and eBay) were just featured in an article on kitchen design in The Milwaukee Journal Sentinel! Dean and Valerie Ferber know a thing or two about shopping around. 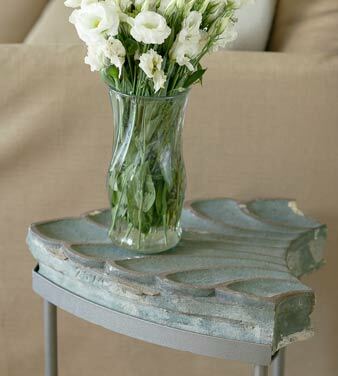 The previous owners of the Ferbers’ cottage-style home in Hales Corners had an antique bread table. 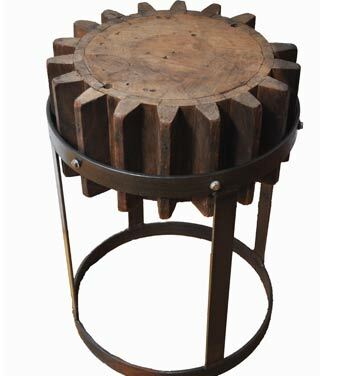 It gave the antique-loving Ferbers an idea. They hunted flea markets, antique shops, estate sales. At one antiques mall, they spotted the perfect piece: a woodworker’s bench. But at $1,100, it was too pricey. Then, on the way to another store, they stopped at an auction and found a bench covered with paint and equipped with two vises. Where others might have seen a mess, the Ferbers saw potential. But first they had to win it. Bidding started near the price of that first bench they’d seen, but there were no takers. The price dropped to $500, then $250, then $100. Finally, Dean Ferber raised his auction paddle. The auctioneer asked for $125, and a man in front held up his hand. Dean Ferber bid $150 – and the 1880s work bench was theirs. With some help, they got it into their van and were off. My parents had to clean & restore the old workbench — but as you can see, it was totally worth it! Most holidays and celebrations, our family members can be found gathered around the new kitchen island from the old workbench serving as a buffet table. This is no longer an old junky piece — or even a piece of furniture; it’s a member of the family.